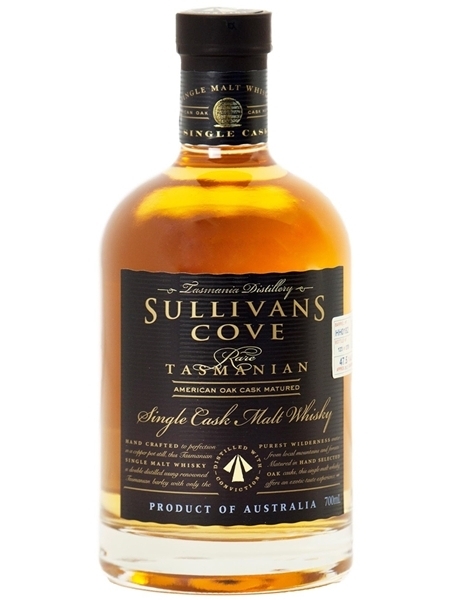 Sullivan's Cove is at the heart of a vibrant renewal of whisky distilling on the Australian island of Tasmania. A British penal colony in the early 18th century, it was awash with illicit stills before outright prohibition was declared and lasted 150 years. The 1990s brought the re-birth of distilleries, with Sullivan's Cove established in 1994 at Hobart. It changed hands in 2003 and everything was moved to it's new location at Cambridge. Despite getting off to a rocky start with immature whisky releases, its malts are now getting high international acclaim, receiving multiple prestigious awards. This 12 year old single malt, "Distilled with Conviction", is matured in American Oak casks and bottled at 47.5% ABV.